"I am a born storyteller . . . I am the last generation of my family to be born in the Boston Mountains of Arkansas and Oklahoma, as well as on a Cherokee allotment. If I don't preserve the stories I've heard they will be lost forever." The following is taken from the forward of Glenn's book Boston Mountain Tales, Stories from a Cherokee Family. The last time I saw Glenn Twist, not long before he died, he was crying. Glenn was a man who did not mask either his thoughts or his emotions. With some difficulty, and with no small amount of determination, he made his way to the microphone in the banquet hall of the student union, on the campus of the University of Oklahoma, to accept the Louis Littlecoon Oliver Memorial Prose Award. Nothing, not the wheelchair he had only recently learned to live with, not the cancer that ravaged his body, and which would finally claim him within a few weeks, nothing was going to stop him from getting to the microphone. His name had been called, an audience was waiting, and he had something to say. "If I could have one wish," he said, "it would be that this award might have gone to a younger person." Then he wept. Through the tears, his jaw stiffened and jutted forward. He composed himself and said, proudly and defiantly, "But I'll not give it back!" All who knew Glenn are saddened that he did not live to see this award-winning manuscript published. But all who knew him are also thankful that he got to experience the joy of winning the award and of knowing that this extraordinary collection of stories would soon be published. It was a courageous task he had set for himself, racing the cancer to complete the book. I don't think he had anticipated that the stories would be so highly regarded by his peers. I don't think he'd had time for such thoughts or concerns. He had written them, not to compete for awards , but to ensure that future generations would know something of a time and place that he had known. That's what mattered to him. The award, I think, only became important to him after he learned that he had won it. Glenn was born July 20, 1917 on his father's Cherokee allotment in Hanson Township, Sequoyah County, Oklahoma. He was keenly aware of being a member of the last generation of his family to have been born on allotted land in the Boston Mountains of eastern Oklahoma. He was determined to preserve the stories he had heard , especially family stories, knowing that if he did not write them, they would be lost forever. Those stories, and the life he had known as a youngster, were his touchstone, his identity. He knew who he was. 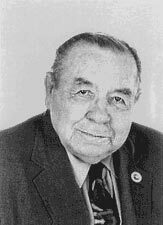 He was an inspiration to everyone in Wordcraft Circle of Native Writers and Storytellers. He joined the organization late in life, as an apprentice, frankly seeking help and guidance from others who had more experience in publishing. Yet, he was an elder, the oldest member of Wordcraft Circle, and his participation in the writing workshops hosted by Oklahoma City University enabled him to draw upon his wisdom and life experiences in helping others. He had much to draw upon. A lifelong habit of hard work and application to the task at hand had manifested itself early, when he graduated from Sallisaw High School a co-salutatorian in 1935 and received a Presidential appointment to the United States Naval Academy. Prolonged illness, however, prevented his enrollment in the Academy, and he received an appointment instead to the Navy's elite Submarine School in New London, Connecticut, after which he was stationed at Pearl Harbor, Hawaii, serving aboard the U.S.S. Argonaut, his squadron's flagship submarine. As a civilian after service in the Navy, he studied at the University of Tulsa and his work in the petroleum industry, including work in Venezuela, were interrupted by the outbreak of World War II. Glenn received an appointment for cadet training in the U.S. Army Air Force. He was commissioned a Second Lieutenant at San Marcos, Texas, as a navigator. After completion of Bombardment School in Carlsbad, New Mexico, he was again commissioned as a Second Lieutenant, this time as a bombardier. Assigned to the 41st Wing of the Seventh Air Force, Honolulu, Hawaii, he saw combat action at Marcus Island and at Truk Atoll, and at the end of the war was stationed in Tokyo, Japan. While in the South Pacific, Glenn developed a new technique of aerial navigation which combined dead reckoning with a one star fix using the sun at high noon. For this work he was appointed Technical Editor for the Western Theatre of Operations for the Air Force magazine, The Navigator. Following the war, he graduated from the University of Tulsa in 1949. In 1952, he was elected to the Oklahoma legislature, serving District No. 6 in the House of Representatives, from Tulsa County. A busy and productive life in several different kinds of private industry included recognition by a California professional association in 1975 as a man who had contributed the most to its development. Stricken with arthritis, he retired in 1979. In retirement, Glenn began writing. Diagnosed with cancer and heart disease and suffering severe arthritis, his perseverance in the face of overwhelming difficulties is a testimony to his character. He inspired others by his example. This book was written by an extraordinary man. * He will be greatly missed, but he will not be forgotten. These stories are his legacy. They were written by a man who knew his origins and who refused to forget a time and place that, because of his perseverance, shall not now be forgotten.